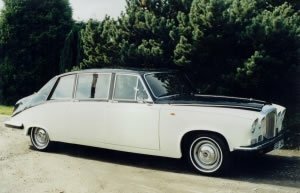 Perhaps the best known big wedding car, our Daimler limousine is truly magnificent. Ours is one of the last built and is in magnificent condition. The woodwork on this majestic vehicle is stunning. Presented in masons black over old English white, this is our largest car, and can accommodate 6 or 7 passengers, making it a superb support car, or a beautiful main car.